For fans of Opensim, some sad news. HyperGrid Business, the leading source of news and other articles about the OS grids has been scaling back it's coverage lately. Maria Korolov, the editor, stated they have just two more articles, "after that, there's nothing else in the pipeline." "What's Next?" Maria stated, "I’m going to continue maintaining the site itself, so that the article archives stay up, and all the resources stay available. I’m also going to do a monthly active grids list — just the list of active grids, not any of the usage stats. I’ll stop updating the list of popular hypergrid destinations, since I’ll no longer have the traffic numbers.I’ll continue running press releases and guest columns, and the free ads will stay up. We might do a short news piece or two each month as well." Of her cutting back, "The reasons are both personal and practical. Personally, I’ve moved on from covering virtual worlds to covering cybersecurity and, most recently, artificial intelligence. ... I barely spend any time in OpenSim anymore." "Practically, there was once a strong possibility that OpenSim would evolve into an open source, virtual reality metaverse. That’s not happening. Our viewers are still stuck where they were ten years ago, without any real support for web or mobile access or for virtual reality headsets. All projects to address that issue seem to have faded away. Instead, the focus has shifted to VR-native platforms from Google, Facebook, and, to some degree, Microsoft. We don’t know yet what Apple is cooking up, but they’re busy as well. 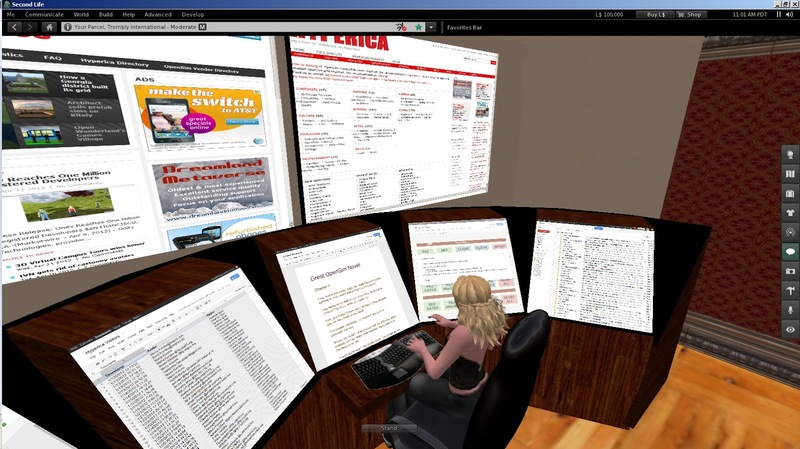 "It’s increasingly looking like the whole SL-OpenSim ecosystem has hit a dead end. It will probably continue to exist as a niche platform for its half million active monthly users, shrinking slightly each year until it’s just a nostalgia thing, like text-based adventure games or manual typewriters." Those commenting on Korolov's article tended to support her observation about OpenSim. One stated, " The open source developers have been great, but if OS is not to degenerate into an historical curiosity, there needs to be a linking of business cases and investments with resources and developers. Investors need to understand the need for Open Source, and OS developers need to be open to dealing with the changes that come with resources." Another commented, " It does feel like we are stuck in Limbo at the moment. ... Opensim development seems to have hit a dead end." A third remarked, "To get to the next level of user involvement is going to take a lot of development. The kind of capitalization needed to do that means big players will develop it. Yes, there is the possibility of a grass roots development effort, but that is much harder to coordinate." But one remained optimistic about OpenSim, "I think Opensim still has a lot going for it and for those of us that still use Second Life too and are perfectly happy still using our PC's." Hamlet Au didn't agree with Korolov's comments, at least in regards to Second Life, " I don't quite buy that last bit, because unlike OpenSim, Second Life is still backed by a profitable company with a highly engaged, highly monetized userbase, giving Linden Lab enough money to evolve ... . As with many open source-based projects, OpenSim was relying almost solely on the community spirit and voluntary work of assorted tinkerers and enthusiasts -- and that rarely leads to a commercial product with a consumer userbase." It was his wish though that Hypergrid Business somehow find a way to continue on, "maybe a benefactor could buy the site and take over?"